March and April can be prime time for ticks to begin seeking out food. Because March and April are busy times for landscapers, it is imperative that your fleet takes the time to prevent and avoid tick bites. Prevention can stop the loss of valuable workers because of common tick diseases such as Lyme Disease and Powassan Virus. 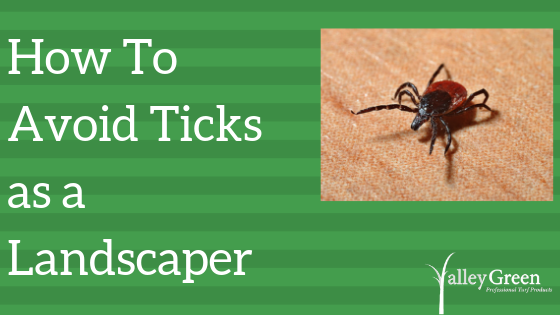 There are several ways on how to avoid ticks as a landscaper and we will show you a few easy ones today. Tick prevention can also be very appealing to clients so consider offering it as service as well. Valley Green offers many different products for tick prevention. CLOTHING: Landscapers should wear long pants and a long sleeved shirt when appropriate. If possible, tuck the pants into the boots and tuck the shirt sleeves into the gloves. This will lessen the chance that they tick has a place to get inside clothing. You should also encourage workers to wear light-colored clothing so ticks are easier to spot. INSPECTIONS: Have your fleet repeatedly check each other for ticks throughout the day. This is especially important if they are entering dangerous areas such as long grass, brush, and dense tree growth. If you find any, put them in a sealed container with alcohol. This will kill them. REPELLENT: There is a broad selection of commercial tick repellents out there. Be sure to spray ankles so that ticks are discouraged from climbing up legs. As with any chemical, follow the spray’s instructions. As as a supervisor, make sure your tick repellent is well stocked. HOME CARE: Encourage fleet members to shower after working in tick prone areas. Have their family members do one more check when they get home. Wash clothes and then dry them for 60 minutes to kill off any intruders. If by chance, an employee is bitten, make sure they pay close attention to their health for 2 to 14 days after being bitten. If they show flu-like symptoms or a rash, send them to a doctor immediately.